DO YOU WISH TO LEARN TO SKI/SNOWBOARD OR IMPROVE YOUR TECHNIQUE? YOUR OBJECTIVES IN A FRIENDLY AND RELAXED ATMOSPHERE. 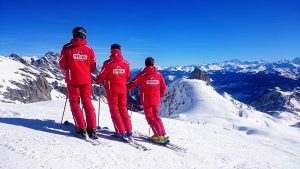 The international ski school proposes you lessons of ski, snowboard, telemark, all winter sports, from learning to improvement. Children since 3 years old can ski at the babylift in the village, small group of 4-6 kids for collective lessons, private lessons from 30 minutes. On the skiing area, collective lessons with group of 6-8 kids. Private lessons from 1-4 people per hour or per day. Also guided snowshoeing and it famous snowshoes-fondue-sledge every Wednesday night. Registration & Information : GOLLUT SPORT, open every day from 8.5 am to 6 pm. 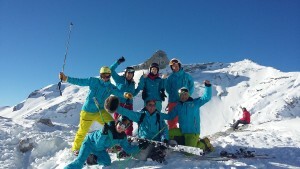 Our ski instructors are waiting to show you all kind of winter sports : ski, snowboard, telemark, etc. 3-year-old kids who want to start to ski or adults who want to improve their style or even teenagers who want to try new thing. Collective or private lessons for you! Every day from December to April, our red jackets are waiting for you.